How daft is your hoax site? I'm no rocket scientist, but I know stupidity when I see It, and I saw a lot of it when I investigated evidence of the alleged hoaxing of the Apollo lunar landings that occurred between 1969 and 1972. This site is no longer updated and will be left to gather dust for all eternity. As part of a shameless and rather obvious publicity stunt, filmaker & fledgling stalker Bart Sibrel (37) ambushed the unsuspecting lunar pioneer and publicly defamed him in front of a film crew, thrusting a bible in his face and demanding that he swear on it that he really did walk on the moon. The 72-year old's measured response to this harrassment? a good solid knuckle sandwich in his face! Good on ya fella!! For a good explanation of just how wrong Sibrel's theories are, see here. Folks in the UK - Have you just seen the programme 'Conspiracy Theory' on Channel 5? Well I suggest you pay a visit to Bad Astronomy and see this pseudo-scientific twaddle debunked. It never ceases to amaze me just how credulous some people can be. The whole Apollo Conspiracy theory has been around for years, and I hadn't given much thought to it, I'd heard some of the 'classic; arguments (e.g. no stars in photographs, flag waving in a windless environment) and not given them too much thought, the reasons for these 'anomalies' are quite straight forward, and could be answered by anyone with a basic secondary school education. It hadn't occurred to me that people take this stuff seriously. My apathy began to diminish when I became aware of a number of rather cranky websites on the Internet purporting to have 'incontrovertible evidence' that Apollo was faked. These sites show no such thing, other than the lack of critical thinking skills there seem to be in the world. I feel a mixture of amusement and dismay when I read some of these pages, and a fair bit of when people try to make a living out of conning people. For this is what I believe some Hoax Believers (HBs) are doing. Many people have comprehensively debunked the arguments these people are putting forward, and yet they still peddle their nonsense books and videos. I think this is dishonest, to put it mildly. This is my contribution to common sense and critical thinking, for what its worth. I was originally going to make this page into a serious and comprehensive debunking of the hoax, but some quick research made it abundantly clear to me that this has already been done with greater articulacy and technical insight than I could ever manage. So I have opted, as we say in England, to take the piss. While I'm doing that however, I hope to provide you, good reader, with the information with which to help you decide if these people really do know what they are talking about, or if it's a load of bovine ejecta. Here I present some of the more ludicrous claims of some hoax-believer sites. It is fair enough for the average person to wonder who could have been filming Armstrong as he came down the ladder to take his giant leap for mankind, or even fail to understand how the Lunar Rover could have fit inside the Lunar Module (it didn't), but I'm afraid one must be pretty dense to go to the effort of building a website to make such claims when a quick search on Google will put you straight. This is one of my favourite examples of just how little research goes into most of the HB Websites. This gem can be found on a few sites, It is taken from the Apollo 11 Lunar Module 'Eagle' during its descent to the lunar surface. The belief here is that dark area E is the shadow of some object being cast onto the moon's surface. To quote 'Moon Fakers': 'I have no idea what it is but obviously it's there'. The Moon Shots Were Faked proclaims that this 'abnormal shadow' should not be so clearly defined. Similar claims are made here and here. The photograph below was taken a little later out of the same window as above. Hopefully you can clearly see the weird shadow is in fact the silhouette of the Reaction Control System (RCS) quad, outside Neil Armstong's window. Well, that was easy. Lunar Module. Commander's window and RCS Quad indicated in red. Al Bean With one reflection too many. 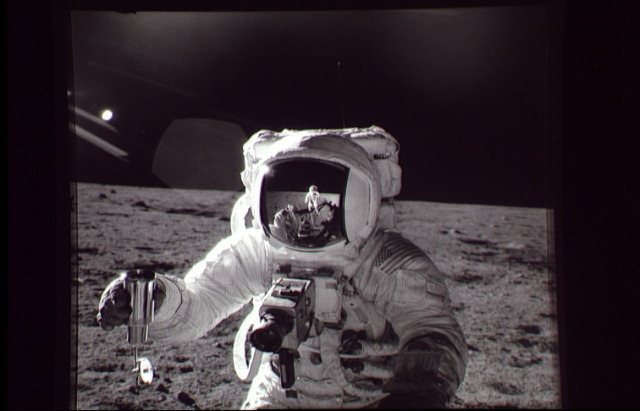 This photograph is of Astronaut Alan Bean during Apollo 12. It appears at HB websiteMoon Shots. The problem here is that the reflection of two astronauts can be seen in Bean's visor. What can this mean? Everyone knows there were only ever supposed to be two men on the moon at any one time. Who let the extra onto the set? Proof of NASA trickery surely? A quick visit to the Apollo Lunar Surface Journal (ALSJ) (although it would be even quicker if these HB buggers bothered to give us the NASA photo IDs) comes up with the same photo, with only one astronaut reflected in the visor. Well, a perplexing mystery indeed. But wait, what is this I find in the section of the ALSJ called FUN IMAGES? Why, It's the mystery photo! Close inspection reveals that the superfluous reflection bears a striking resemblance to the one in this photograph. The original Photo, in all its single-astronaut-reflecting glory. To most people this image looks like a picture of Buzz Aldrin's bootprint. But not to Seethruart/Piper. To him, this is long-range photo of an alien city. You would be forgiven for thinking that perhaps this fellow is having a joke, I still can't quite decide myself. But he's been around for over a year, making wild claims wherever anyone will listen, and he gets very upset when people tell him he is wrong, or suggests he should seek the services of a good psychiatrist. If you have been a victim of Seethruart's unique brand of hoaxology, the people at Piper Anonymous want to help. Howler # 5- Live from the moon? Video shot from a moving rover - but how??? This picture is a still taken from a movie shot during Apollo 15?, taken on the Lunar Rover while it is driving across the lunar surface. Cosmic Dave is perplexed. Cosmic Dave knows that in order for live TV pictures to be beamed back to Earth, the rover must be stationary, otherwise the rover's antenna cannot be be precisely aligned with Earth. This much is true. Fig 1.- The TV camera ! Yes, my observant friends, the camera that Cosmic Dave believes made the film in question is actually in the film itself!. The footage was shot using the 16mm movie camera that was also taken to the moon. An example of the relative comera positions is shown in Fig 2. Next time you visit a Hoax-believer's site, why not amuse yourself by calculating it's level of silliness using the simple checklist below. +1 for each unreferenced photograph. +2 for excessive use of UPPERCASE text to emphasize points. additional +10 if four or more all of the above. additional +20 if four or more the above. On the off-chance that anyone actually does this, please email us with the site URL, the score you calculated, and I'll post the results. The Good Guys - follow these links and you'll learn something. Pretty much destroys every conspiracy theory there is. The Bad Astronomer deals specifically with the TV program shown on FOX TV Network in the US, and in the UK on 'Bravo', and recently on Channel 5. There is also a discussion forum there, where like-minded warriors for truth do battle against the dark forces of Apollo tomfoolery. A Critique of "Was It Only A Paper Moon?" Larry Jacks magnificiently debunks James Collier's travesty of the truth. Bob Braeunig knows the answer. This page is part of a larger site containing lots of interesting info for all space and rocket nuts. For victims of Seethruart/Piper deranged rantings. A waste of good video tape. Jim Collier's "Was it Only a Paper Moon?" You'll laugh & you'll cry. Heroically bad. If you must, you can watch it for free with a RealVideo player. The first stop for any self-respecting Apollo geek. Providing full transcripts, photgraphs, and loads of other stuff relating to Apollo lunar activity. Splendid. "... to provide photo-reference and technical information on the Saturn V, Saturn Ib, Apollo Spacecraft and Launch Complex 39." - Super. An invaluable reference for all things astronautical. Interesting site by a former engineer at Grumman - manufacturer of the LM. Please note: If you are the subject of this website, and you feel in anyway maligned, ridiculed, libeled, misrepresented or otherwise wronged, do not hesitate to send us an e-mail, which we shall subsequently ignore.